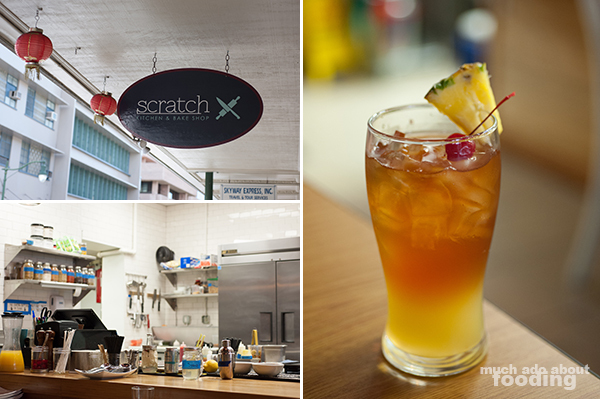 On our trip to Oahu in December 2014, our friend's friend was quite eager to show us Scratch Kitchen & Bake Shop, a fresh, fairly-new restaurant that had opened to great responses. It focuses on catering to the breakfast and brunch seekers with several options for both mealtimes, open at 8AM and closing at 2PM with lunch service starting at 10:30AM. 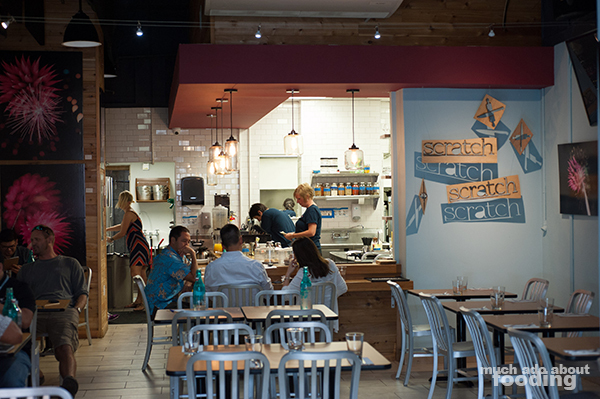 The name itself is an indicator of what they want to focus on - making food from scratch. 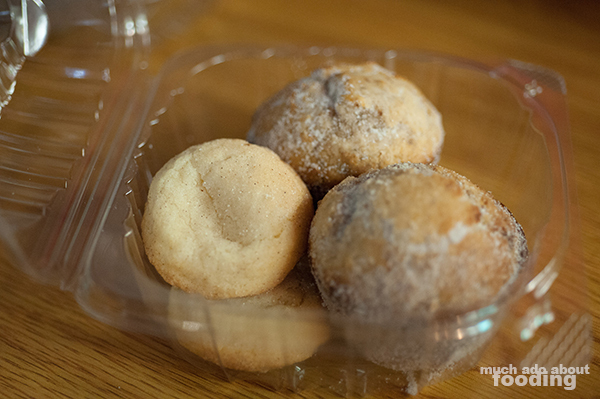 We saw through the open kitchen that this was the case for their baked goods at the very least. The brunch we enjoyed was from their Fall 2014 menu so it is possible the dishes I write about next might not be in the menu you'll be noshing on but at least you can get a sense of their style! The restaurant is located in downtown Honolulu in the Chinatown part of the city which gave the hanging lanterns outside a reference point. Otherwise, I would have thought it was a Chinese bakery of some sort with a modern name. Canvased photographs line the walls inside, and a neat mobile of carved wooden signs projects shadow images onto the far wall, showing off the restaurant's name and logo. We had missed the breakfast crowd so were seated promptly; I've heard that there are often lines because they do not take reservations. Unfortunately, arriving later in the day gets you better seating but may result in dishes being unavailable. After all, they make the food from scratch. To wake up in the morning, Duc ordered a tall glass of their Plantation Iced Tea ($3.75) which basically was a tropical, pineapple-focused spin on an iced tea. It came out a little watery though and the flavors muted so we wouldn't recommend it there. 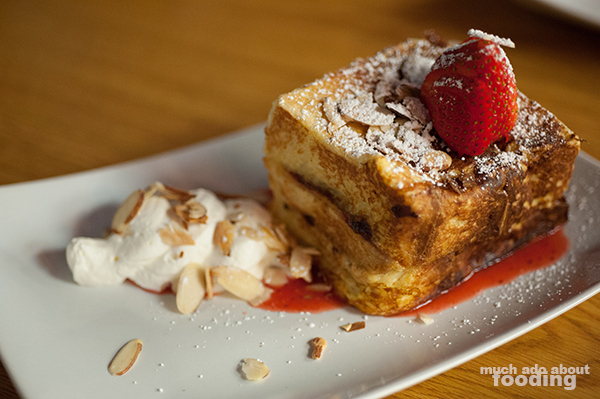 Our friend ordered the looming stack of Stuffed French Toast ($10 - strawberries, Nutella, almonds, and mascarpone) pictured above, a thick-cut tower of breakfast sweetness. It had both savory and sweet elements to it but has to be for a bread lover considering the width of each slab. The light dusting of powdered sugar and slivered almonds was a nice touch but the real star was the way the mascarpone offset the otherwise heavy bread slices. The remainder of our group ordered dishes that leaned more towards lunch items than breakfast (though only the last two listed below were on the Lunch menu). 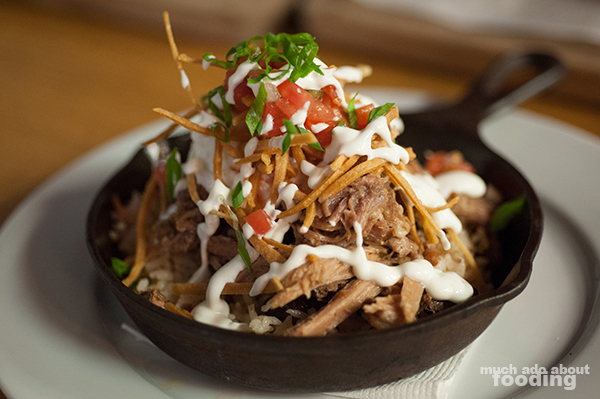 Duc's pick was their Calentado ($12 - Puerto Rican style roasted pork, red beans, rice, 142° egg, citrus mojo, lime crema, and crispy tortilla) which arrived in a small cast-iron skillet looking like a festive pork party. The pork was tender and came apart with ease as he picked at the food with a fork. The egg may not have been very necessary though as there was plenty of moisture from the other elements in the dish. We especially found the lime crema to be enjoyable, and the thin tortilla strips added necessary texture. My order was not so well received nor was it as photogenic. The Seared Scallop Tagliatelle ($15 - smoked sausage, Creole etouffee, hand-cut pasta, and scallions) from the lunch menu looked and smelled like a bowl of homestyle comfort food. However, it lacked the strong flavors necessary for that category and could have benefited from basting in itself for a longer period of time. The etouffee was disappointing and the scallops very scattered throughout the dish, making for varying tastes per bite. I enjoyed that the pasta was fresh as that difference is very apparent but because they were so and smothered in etouffee, they broke off too easily and ended up in a mess rather than in attractive long strands. 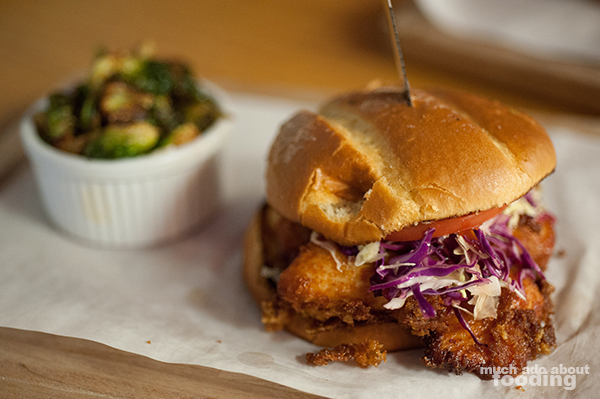 Our friend snagged the Cornflake Chicken Club Sammy ($12 - smoked bacon, Carolina slaw, tomato, harissa-garlic aioli, brioche, and brussels salad) also from the lunch menu, and that was easily my favorite bite of the rest. Who can say no to fried chicken of any type? The brioche had also been toasted on the inner side so there was a double crunch with each bite. The seasoned cornflakes were perfect for the juicy chicken and the slaw added a different type of crunch - a healthier one. Think of it as being similar to chicken katsu. Now you know what I liked it! We ended the brunch with a to-go container of some of their baked goods, courtesy of the owner as they were closing up "shop" for the day. 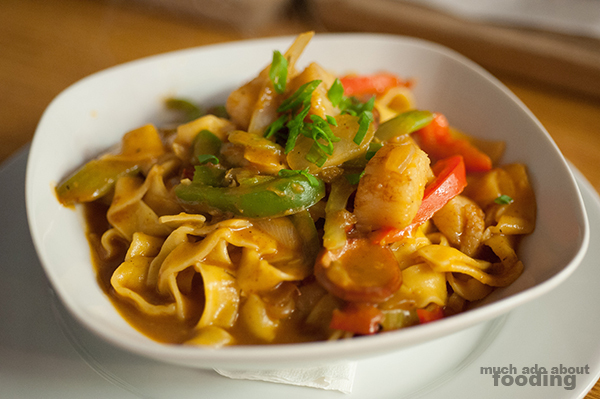 Overall, the restaurant did a decent job on our dishes but it was not a place that blew me away with its food.